Mom was right. 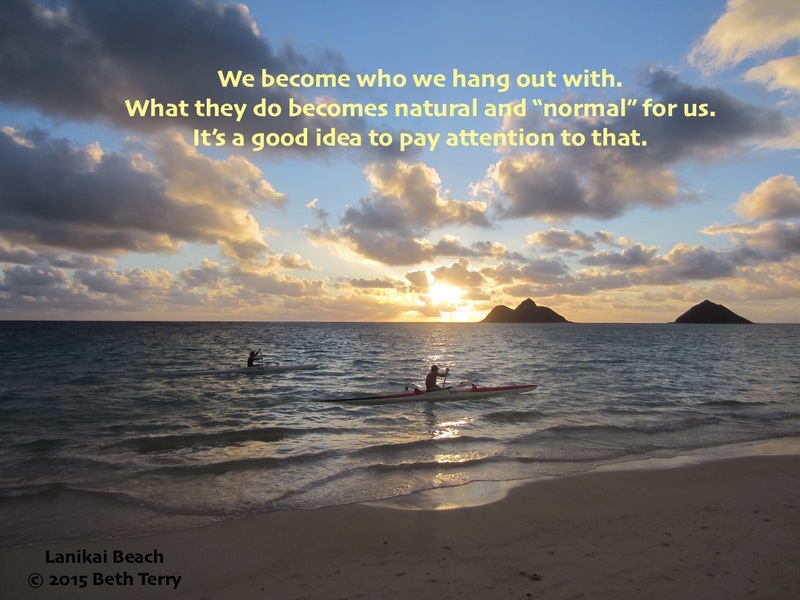 Who we hang out with really does influence how successful our lives will be. If everyone in our group learns a skill or has a hobby, it becomes a given that we will do that, too. This is how I wound up with a pilot’s license. I got a part time job in college working the Unicom at the regional airport. Everyone there had a pilot’s license. Instead of people saying, “I would love to get a license,” the comments to me were, “What do you mean you don’t have your license?” The peer pressure alone and the daily opportunity to get one made it easy to jump in head first. When I moved to Hawaii, my roommate was already on a canoe paddling team because her coworkers at the hospital had formed one. They were able to take time off from work to practice because they were competing with other island medical centers in paddling competitions. For her it was natural and normal, and the time and equipment were readily available. Look at where you are today and what skills and hobbies you have. Who influenced you? Why do you have those abilities? Conversely – What has held you back from getting where you want to go? Because the reverse is also true: If what you want to do is strange or out of the ordinary for your immediate group, they may discourage you from acquiring those skills and hobbies that you desire. We always have choices. We can decide those things aren’t all that important, or we can enlarge our circle of friends and find some influencers who do what we want to learn. Figure it out! How long do you think you have?